» The BBC: Rock at Hank's Cafe Honolulu, 8:30 p.m. Tuesdays. Call 526-1410. » Bobby: The pianst from Kauai performs 5 p.m. Thursdays at Hank's Cafe Honolulu. Call 526-1410. » Chicago Bob: Enjoy rock and folk music, 8 p.m. Thursdays at Hank's Cafe Honolulu. Call 526-1410. » The Cosmopolitan Jazz Trio: 9 p.m. to 1 a.m. Saturdays at The Dragon Upstairs, above Hank's Cafe Honolulu, 1038 Nuuanu Ave. Call 526-1410. » Michael Fahey: 8 to 11 p.m. Wednesdays at Hank's Cafe Honolulu. Call 526-1410. » The Geezers: Get a little bit country, 6 p.m. Sundays and 9 p.m. Fridays at Hank's Cafe Honolulu. Call 526-1410. » Rich Lowe: On the piano, 8:30 p.m. Saturdays at Hank's Cafe Honolulu. Call 526-1410. » Na Kama: 7 p.m. Mondays at the Outrigger Waikiki Hotel (On the Beach) Hula Grill. Call 923-4852. Also, 8 p.m. Thursdays and 8:30 p.m. Saturdays at The Cheesecake Factory in the Royal Hawaiian Shopping Center. Call 924-5001. » Sonny Silva: 8:30 p.m. Tuesdays and Saturdays at Brasserie Du vin, 1115 Bethel St. Call 545-1115. » Ray Sowders: 5 to 6 p.m. Tuesdays, Saturdays and Sundays at The Elegant Dive in the Hyatt Regency Waikiki, 3rd Floor, Pool Deck, call 923-1234. » Victoria Stringer: Contemporary and Hawaiian music, 6 p.m. Fridays at Hank's Cafe Honolulu. Call 526-1410. » Satomi Yarizomo: Performs jazz music, 9 p.m. Thursdays at The Dragon Upstairs (upstairs of Hank's Cafe Honolulu). Call 526-1411. » Byron Yasui and Benny Chong: 7 to 9:30 p.m. Thursdays and Fridays at the Pacific Beach Hotel's Neptune restaurant. To reserve, call 922-1233. » eight0eight: 7 to 10 p.m. Thursdays in March at Kincaid's; and 9 p.m. to 12:30 a.m. March 23 at Gordon Biersch. Call 848-6517. » Celtic Keiki: Join Caleigh and Delia Fabro and Kiana Ahovelo as they transform Liliha Library to ancient Ireland with their music and dance, 3 p.m. Friday. » Stephen Inglis: 3:30 to 5:30 p.m. Friday and Saturday at Holokai Grill; 7 to 9 p.m. Friday at rRed Elephant; 8 p.m. to midnight Sunday at Anna Bannanas; 9:30 to 11:30 p.m. Wednesday at Indigo Restaurant; and 5:30 to 10 p.m. March 22 at Ola Restaurant. » The Coconut Joe Quartet: 6 to 10 p.m. Friday and March 30 at The Ground Floor, 727 Richards St. Call 538-6012. No cover. Also, 6 to 9 p.m. Tuesday at the Honolulu Club Bar and Lounge, 932 Ward Ave., seventh floor. Call 543-3900. No cover. Validated parking. » Jim Smart: Solo acoustic tribute to the Kinks on piano and guitar, 7:30 p.m. Friday at Coffee Talk, 3601 Waialae Ave. Free. » H2O: 9 p.m. to 1 a.m. Friday and March 30 at the Esprit Night Club & Lounge; 8:30 p.m. to 12:30 a.m. Saturday at Gordon Biersch; and 8:30 p.m. to midnight March 24 at Gordon Biersch. » Fusion: 8 to 11 p.m. Friday at Big City Diner in Kailua; 9:30 p.m. to 1 a.m. Saturday at Lily Koi Restaurant & Lounge; and 9:30 p.m. to 1 a.m. March 24 at Don Ho's Island Grill in the Aloha Tower Marketplace, $3 cover, call 528-0807. » Royal Kunia Street Band: 8:30 p.m. Friday at Ige's. Free. Call 486-3500. » Honolulu Jazz Quartet: 2 p.m. Saturday at Borders Ward Centre. Call 591-8995. » The Art of Choral Music: UH's Chamber Singers and Concert Choir will perform Benjamin Britten's "Evening Primrose," Randall Thompson's "Frostiana" and Einojuhani Rautavaara's "Suite de Lorca," 7:30 p.m. Saturday in the Orvis Auditorium. Directed by Esther Yoo. Admission is $10, general and $6, students and seniors. Call 956-8742. >> Jamarek: Percussion ensemble welcomes dancers and music lovers, 8 to 11 p.m. Saturday at the Soullenz Gallery. Cover: $10. All ages welcome. » Naneananea: Hawaiian music, 1 p.m. Sunday, Ward Warehouse stage. Part of the Na Mele Nei concert series. Free. Call 596-8885. » The Dean Taba Quartet: Noel Okimoto on the vibraphone, DeShannon Higa on the trumpet, Abe Lagrimas on the drums and Taba on the bass, 6:30 p.m. Wednesday at The Honolulu Club. Cover: $5. Validated parking. Part of the club's jazz Wednesday series. » "Building Harmony": Get a preview of the show that BYU-Hawaii's concert choir will present in China and Mongolia, 4 to 5 p.m. March 23 in the Honolulu Hale Courtyard. Free. For information, call 293-3699. » Beat Boys: 8:30 p.m. March 23 at Ige's. Free. Call 486-3500. » Partners in Time: 7:30 p.m. March 24 at the rRed Elephant. The members of Partners in Time -- Kip McAtee (guitar), Anita Trubitt (accordian), Ernie Provencher (bass) and Marcia Kemble (hand drum) -- will be joined by Souren Baronian from New York. Tickets are $17.50 and can be purchased at honoluluboxoffice.com or by calling 550-8457. » Recital: Featuring I-Bei Lin on the cello, Jessica Choi and Thomas Rosenkranz on the piano, Bryan Sanchez on the drums and Byron Yasui on the double bass, 7:30 p.m. March 24 at the University of Hawaii-Manoa, Orvis Auditorium. Pieces include Beethoven's Sonata for Cello and Piano, Op. 5 No. 1; Chopin's Polonaise Brillante for the Cello and Piano, Op. 3; and Claude Bolling's Suite for Cello and Jazz Piano Trio. Admission is $12, general and $8, students and seniors. Call 956-8742. » Na Kupuna O Na Mele Nei: Featuring Na Wahine U'i and Manny Fernandez, 1 p.m. March 25, Ward Warehouse stage. Part of the Na Mele Nei concert series. Free. Call 596-8885. » Keauwena: Hawaiian music, 1 p.m. April 1, Ward Warehouse stage. Part of the Na Mele Nei concert series. Free. Call 596-8885. » Pilioha: Enjoy the stylings of the winner of the 2006 Ka Himeni Ana award, 1 p.m. April 15, Ward Warehouse stage. Part of the Na Mele Nei concert series. Free. Call 596-8885. 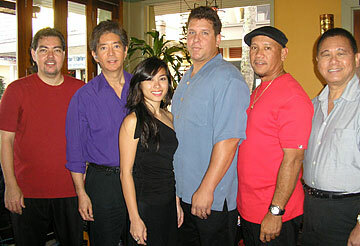 » Na Mele Nei Backyard Gang: Hawaiian music, 1 p.m. April 22, Ward Warehouse stage. Part of the Na Mele Nei concert series. Free. Call 596-8885. » Footnotes: Various performers get together to entertain, 1 p.m. April 29, Ward Warehouse stage. Part of the Na Mele Nei concert series. Free. Call 596-8885. To get listed in the music calendar, send items to Music Calendar, 500 Ala Moana Blvd., Suite 7-210, Honolulu 96813 or e-mail features@starbulletin.com.